Yesterday we published the article “Why Won’t Helvetica Go Away” in which Alastair Johnston discussed the evolution of Helvetica, the reasons for its popularity as well as his thoughts on why designers should start questioning the usefulness of Helvetica in their projects. Hours later Indra Kupferschmid published an article in which she corrected some of the facts presented in the original article. We republish Indra’s article to correct the factual errors, with her permission of course.—Ed. This isn’t a “blue pencil” (I could never challenge master Shaw); just a lazy, quick rant. Alastair Johnston wrote an article on Helvetica posted on Smashing Magazine yesterday. I don’t want to comment on his strong opinion and cut out most of his subjective ranting. But some facts seem to have gotten a bit wonky. Yesterday we published the article “Why Won’t Helvetica Go Away” in which Alastair Johnston discussed the evolution of Helvetica, the reasons for its popularity as well as his thoughts on why designers should start questioning the usefulness of Helvetica in their projects. Hours later Indra Kupferschmid published an article in which she corrected some of the facts presented in the original article. We republish Indra’s article to correct the factual errors, with her permission of course.—Ed. This isn’t a “blue pencil” (I could never challenge master Shaw); just a lazy, quick rant. Alastair Johnston wrote an article on Helvetica posted on Smashing Magazine yesterday. I don’t want to comment on his strong opinion and cut out most of his subjective ranting. But some facts seem to have gotten a bit wonky. The other day someone sent me a link to a website with the preposterous title of “The 100 Best Typefaces of All Time.” Topping the chart was Helvetica, and that stirred my ire. I dismissed the list because it was based on marketing figures from one source, FontShop, coupled with the opinions of half a dozen Berlin-based typographers, but I was still incensed. The ranking does not include free fonts or components from operating systems or software (Arial, Verdana, etc. ), but focuses exclusively on licensable printers’ typefaces. Types that, over the centuries, have been interpreted individually by several different foundries (Bodoni, Garamond, Futura and so on) were judged collectively and included as a single entry. Futura is a typeface by the Bauer type foundry. This is an incredibly brief summary of 30 years. Or what time is the author talking about when he says “suddenly”? Berthold did not rework Akzidenz-Grotesk until after Helvetica was issued (and became threateningly successful) — it had been available ever since 1898; it just became very popular in the 1950s. Neue Haas-Grotesk was based on Haas’ Französische Grotesk (which was based on Breite halbfette Grotesk by Schelter & Giesecke) and Haas’ Normal-Grotesk (which was based on Neue Moderne Grotesk by Wagner & Schmidt), with an eye on competing typefaces such as AG and Monotype Grotesque. NHG was not “picked up” by Stempel but insistently offered to it by Haas against its initial skepticism. I don’t understand what the author is trying to say in that last paragraph. Geometric sans-serifs were popular in the 1930s, yes, and all foundries “had to” issue their own, yes — almost all did, but well before German foundries cut down type production from 1942 on. Also, it never seized completely. Some foundries were destroyed in the war (Klingspor, for instance), but others (such as Stempel) not at all. The surge in the use of grotesques such as Akzidenz-Grotesk and — not to forget — Monotype Grotesque is rooted in the 1950s in Switzerland, and arose later in the design of the so-called “neo-grotesk” faces. The taste in typefaces was rather different in Germany, with Futura, Erbar and Neuzeit still widely used after Word War II. Also, the more calligraphy-inspired style of Schneidler, Trump and Zapf was very popular. As Paul Barnes points out rightly, “As Ruder & Hofmann were of the Basle school they used Univers/Akzidenz Grotesk not Helvetica”. Fuelling the rivalry between the Swiss “schools,” Zürichers like Hans Neuburg and Josef Müller-Brockmann were advocating Helvetica. The latter designed promotional material for NHG and Helvetica, such as the famous Satzklebebuch binder. Only Basel-based designer Albert Gromm once designed one of the initial marketing flyers for Helvetica in 1959. 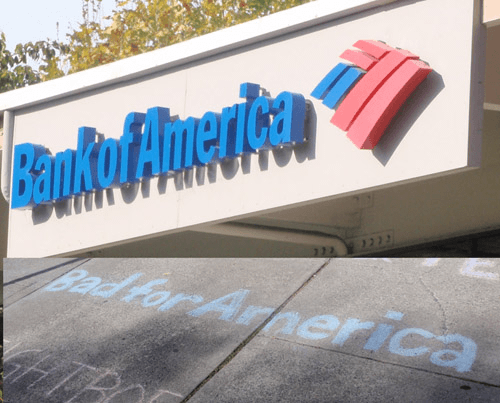 Bank of America does not use Helvetica. Its corporate typeface is Franklin Gothic. The chalk artist doesn’t even try to mimic Helvetica, but rather mimics the bank’s actual typeface. Stempel had held Haas shares since 1927, first 45%, then 51% from 1954 on. Stempel’s majorities of shares were owned by Linotype. Haas bought Deberny & Peignot (and thus Univers) in 1972. When Stempel closed in 1985, its Haas shares went to Linotype, which purchased all rights to the Haas foundry in 1989. My impression is that people who hate Helvetica never really looked at the original, but detest — rightfully — the lousy version that comes with computer operating systems, digitized in a hurry in the early days of PostScript. For a detailed comparison and for more information on Helvetica’s history, see the Neue Haas Grotesk feature website. The original design of Neue Haas-Grotesk was not as square as Neue Helvetica. Also, I wouldn’t say that the “a,” “s” and “e” in Helvetica “resemble one another,” as he suggests in the following paragraphs, but rather that the “I” and “l” and the “rn” and “m” could be confused. Frutiger did not try “to improve on Helvetica.” Maybe he tried to improve the grotesque model/genre. Frutiger had begun work on Univers much earlier than Haas did with Neue Haas-Grotesk. Both typefaces were released at the same time, with all foundries knowing about the work of the others (also Bauer with Folio, released the same year, 1957). The expansion of Helvetica was not “caused” by Univers. 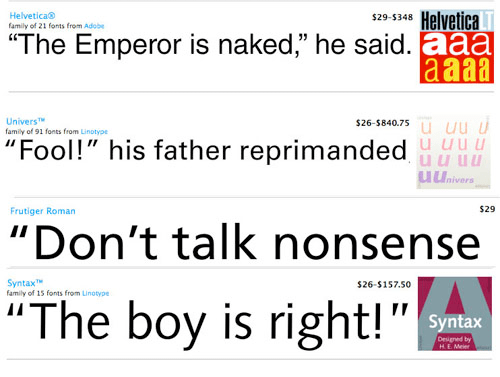 It would help if the samples of each typeface showed the same text and characters, which is very easy to do on MyFonts. What a weak image to prove debatable points. I can’t bring myself to quote the rest of the article. Read on over on Smashing Magazine.